The G-Pen F350 is an ultra slim, super compact portable tablet with a cordless, 1024 level pressure sensitive pen. The 2000 lines per inch (LPI) resolution provides the accuracy required for a wide range of design, drawing and writing applications. Using a pen and tablet is much more natural, much more precise and gives you far greater control than can be achieved with a mouse. With a very accurate, one-to-one mapping of every point on the tablet to the corresponding point on the screen, the cursor movement reflects exactly the movement of the pen. This makes a high quality tablet like the G-Pen F350 the ideal choice for any design, drawing, sketching, painting, photo manipulation, digital signing or hand writing recognition application. Because of its slim design and compact dimensions this tablet won?t take up too much space on your desk and can even be used on your lap for a natural sketching posture. It is sufficiently small to be easily slipped into a laptop bag ? so you can enjoy all the benefits of a tablet wherever you are. It also features 22 programmable shortcut cells which allow instant access to frequently used applications and office tools as well as Windows 7/Vista functions. The cordless pen is lightweight and easy to handle. 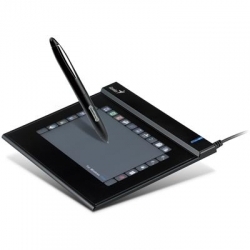 It features 1024 levels of pressure sensitivity to smoothly adjust line thickness in drawing applications. It has two buttons ? one in the tip and one on the barrel. It is powered by a single battery which lasts for up to one year. Working Area: 3" x 5"